Today I woke up like so many other Bostonians and was taken aback by the warm weather. It was in the upper 60s and sunny (at least in the morning). From what I’ve been told, not only did the state have a horrible winter but spring and summer have taken longer than normal to arrive. So today’s shocking (and welcome) temperature change made me remember something I had heard rumors of but had not really experienced yet. The first truly warm spring day in the city is called “Hatching Day.” Why? Because all of the “chicks” come out. This phrase is not directed at any baby birds. No no. On hatching day, the ladies of Boston come out in their dresses for the first time since fall. Sure, this happens a lot of places that have rough winters. However, you can see it has a huge impact on this city. Hatching day signals that the time has come to pull out those spring dresses. It’s not just the women in the city who strut around in their trendiest spring get ups, but other residents seem to crawl out from their winter hideaways. Loads of people are running, walking or biking around the city. Families take kids to the playground; restaurants start to bring tables onto the sidewalk and open patios. Boston comes alive with activity and excitement! Hatching day is such a subtly celebrated event here – yet one that everyone’s been waiting for. Even if rain comes tonight or tomorrow, the Boston summer is coming – and all of Boston is getting ready to take advantage of it! 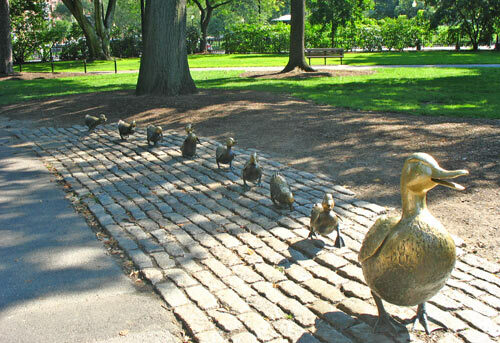 This entry was posted on Sunday, April 24th, 2011 at 6:55 pm	and tagged with Boston, common sayings, Hatching Day, Spring, warm weather and posted in Random. You can follow any responses to this entry through the RSS 2.0 feed.